The participants and trainers of the International Deans' Course together in front of the Gadjah Mada University of Yogyakarta. 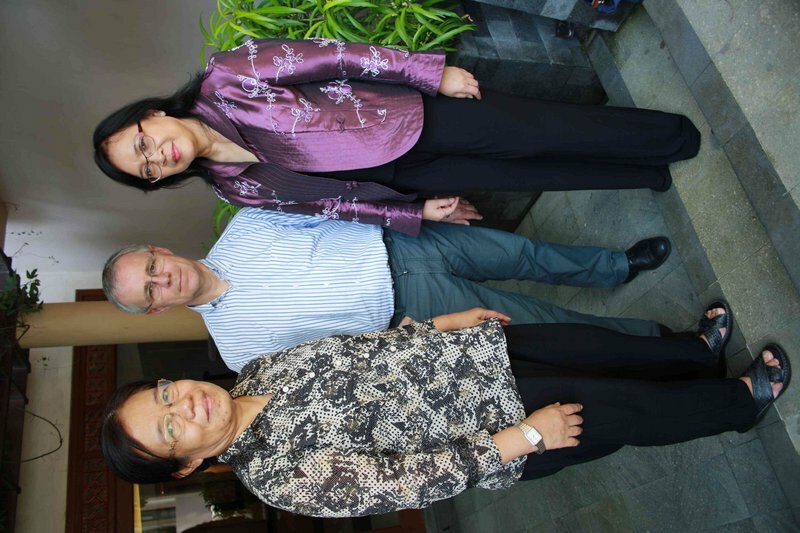 Participant Aye Aye Tun from Myanmar (left) with her trainers Prof. Dr. Peter Mayer from the Osnabrück University of Applied Sciences and Prof. Dr. Supra Wimbarti from the host university in Yogyakarta. 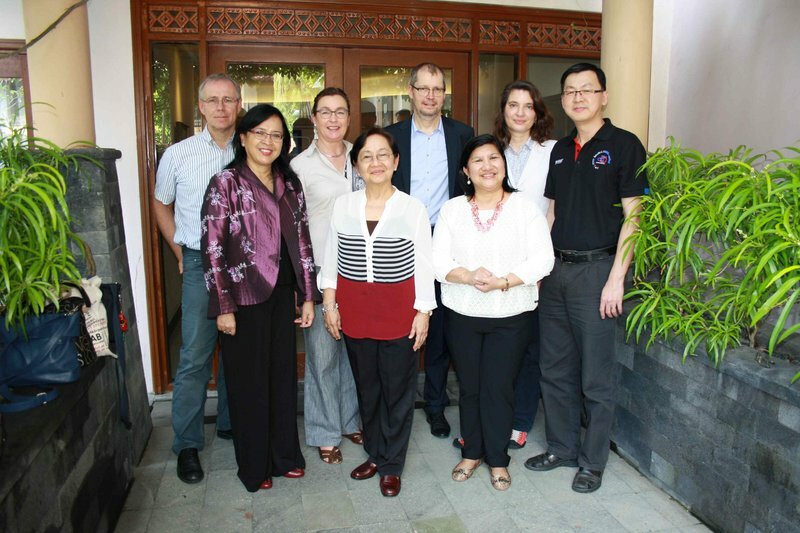 The Gadjah Mada University in Yogyakarta was the third and final host of the "International Deans' Course" (IDC) 2016/17 which is organised annually by the Osnabrück University of Applied Sciences. 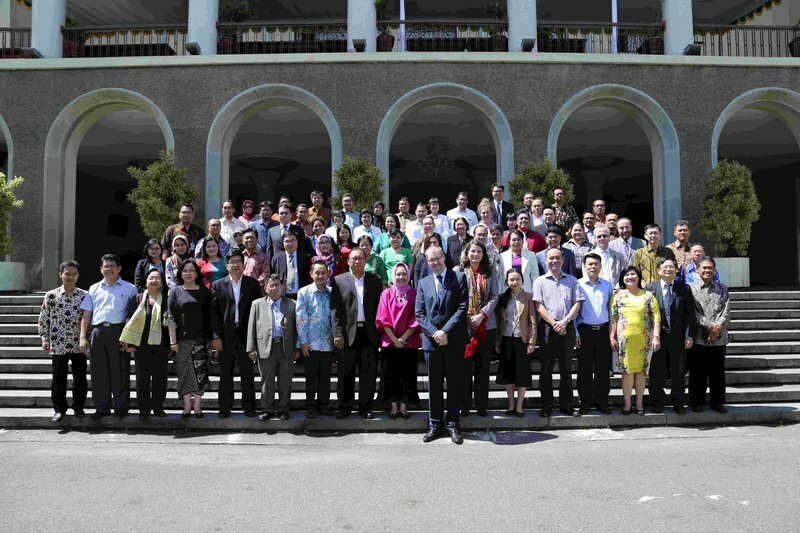 After stays in Osnabrück, Berlin and the Philippine Capital of Manila, the thirty deans from Southeast Asia gathered for four days in the Indonesian Island Java. The participants from Cambodia, Indonesia, Laos, Malaysia, Thailand, Vietnam and the Philippines occupied themselves with work fields of higher education management. Topics like human resource management and internationalisation were addressed. Especially the results of the individual change-projects at the home universities were evaluated. Project leader Prof. Dr. Peter Mayer, professor for general and international economics at the University of Applied Sciences Osnabrück, gave insight in the entrepreneur idea. Mayer was fond of the participant’s commitment, "the reality of higher education in Laos, Cambodia and Myanmar is completely different from what we are used to. It is apparently obvious that the exchange among themselves is an exciting chance that would only rarely or never occur." Besides the subject-specific input, the conversations at the common dinners as well as during the panel discussions constituted an essential part. Prof. Dr. Aye Aye Tun from Myanmar, recently appointed rector of the Dagon University, accounted that she could already put new elements into practice: "In the office of the Education Secretary in Naypyitaw I held a presentation on the future development of the Dagon University. The implemented ideas also based on my new knowledge from the IDC." With the end of the programme, the long-term trainer Prof. Dr. Adelaida C. Gines from the Philippine Normal University entered retirement. Ten years ago, she contributed to the design to this special programme. 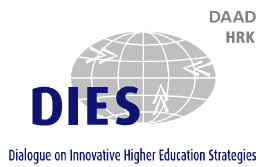 The IDC is a joined initiative of the German Rector’s Conference (HRK), the German Academic Exchange Service (DAAD), the Alexander von Humboldt Foundation (AvH), the Centre for Higher Education Development (CHE), the Freie Universität Berlin and the Osnabrück University of Applied Sciences. The DAAD funds the project with means of the German Federal Ministry for Economic Cooperation and Development (BMZ).